Helen Keller International (HKI), a leading global health organization that reduces blindness and prevents malnutrition worldwide, has joined a new effort to further develop and evaluate Golden Rice as a potential tool to reduce vitamin A deficiency. Leading nutrition and agricultural research organizations are working together to evaluate Golden Rice as a potential tool to reduce vitamin A deficiency in the Philippines and Bangladesh. Announced today, the International Rice Research Institute (IRRI) and national rice research institutes in Bangladesh and the Philippines have joined with Helen Keller International (HKI), a leading global health organization that reduces blindness and prevents malnutrition worldwide, in a new effort to further develop and evaluate Golden Rice as a potential tool to reduce vitamin A deficiency. Golden Rice is a unique type of rice that contains beta carotene, a source of vitamin A.
Vitamin A deficiency is the leading cause of preventable blindness in children. It also impairs immune system function and increases the risk of death from certain childhood diseases. Globally, approximately 670,000 children die every year and another 350,000 go blind because they are vitamin A–deficient. HKI has been advocating the elimination of vitamin A deficiency for more than 40 years, working with governments and other partners to reach those most in need through various interventions. A status, including vitamin A supplementation, food fortification, dietary diversification, and promotion of optimal breast-feeding,” said Ms. Nancy Haselow, HKI vice president and regional director for Asia-Pacific, who has been designing, implementing, and testing vitamin A delivery programs for more than 20 years. “We welcome the opportunity to see if Golden Rice is efficacious and can fill the gap in access to adequate vitamin A for all vulnerable groups in a sustainable way,” she added. According to research published in the American Journal of Clinical Nutrition, daily consumption of a very modest amount of Golden Rice – perhaps a cup (or around 150 g uncooked weight) –could supply 50% of the Recommended Daily Allowance of vitamin A for an adult. “Since a large proportion of vitamin A–deficient children and their mothers reside in rice-consuming populations, particularly in Asia, Golden Rice should substantially reduce the prevalence and severity of vitamin A deficiency, and prevent at least hundreds of thousands of unnecessary deaths and cases of blindness every year,” said Dr. Alfred Sommer, professor and dean emeritus, Johns Hopkins Bloomberg School of Public Health. Dr. Sommer is an internationally acclaimed public health scientist who has been at the forefront of research into vitamin A deficiency, leading major studies that were fundamental to the current understanding of the effect of vitamin A supplementation on mortality, malnutrition, and blindness. The Bangladesh Rice Research Institute(BRRI) and the Philippine Rice Research Institute (PhilRice) have been working with IRRI on Golden Rice for several years. They are leading the development of Golden Rice varieties in their countries. “We are conducting our breeding carefully to make sure that the new Golden Rice variety retains the same high yield, pest resistance, and excellent grain and eating qualities while helping to address the pervasive problem of vitamin A deficiency in the Philippines,” said Dr. Antonio Alfonso, chief science specialist and Golden Rice team leader at PhilRice. “I am delighted with our success in breeding a Golden Rice version of Bangladesh’s most popular rice variety, BRRI dhan29, which we hope will make a substantial contribution to reducing vitamin A deficiency across the country,” said Dr. Alamgir Hossain, principal plant breeder at BRRI. Golden Rice, which is genetically modified, will be available to farmers and consumers only after it has been approved by national regulatory bodies. This project will also generate and collect safety information related to Golden Rice for submission to regulators as early as 2013 in the Philippines and 2015 in Bangladesh. Golden Rice is expected to cost farmers about the same as other rice, and they will be able to save seeds for replanting. 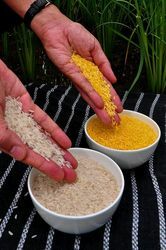 The inventors of Golden Rice, Professor Ingo Potrykus and Dr. Peter Beyer, donated the technology in 2000 as a gift for resource-poor farmers in developing countries because of its enormous potential to benefit public health. This non-profit Golden Rice project is supported by the Bill & Melinda Gates Foundation, the Rockefeller Foundation, the United States Agency for International Development, and other donors. Golden Rice contains beta carotene and is being developed to help tackle vitamin A deficiency. This project will further evaluate and develop Golden Rice for Bangladesh and the Philippines. Helen Keller International will assess how daily consumption of Golden Rice can help reduce vitamin A deficiency. Golden Rice is genetically modified and will be available to farmers and consumers only after it has been approved by national authorities. The International Rice Research Institute (IRRI) is a nonprofit independent research and training organization that develops new rice varieties and rice crop management techniques that help rice farmers improve the yield and quality of their rice in an environmentally sustainable way. The organization works with public and private sector partners in national agricultural research and extension systems in major rice-growing countries to do research, training, and knowledge transfer. Their social and economic research also informs governments to help them formulate policy to improve the equitable supply of rice.